Then along came the ‘budget’ airlines. From the beginning they made the passengers pay for the snacks and drinks, and gradually, hot food, too. On top of selling food to 150 passengers, the crew had to try to sell so called ‘duty free’ gifts and toiletries. This trade also goes back to the early days, when such on-board sales were dominated by tobacco and alcohol. Now that trade has gone, and we are left with a splendid trade in unnecessary goods the passengers forgot to buy at the airport. The news story last December about Ryanair pushing on-board sales targets was very revealing. I should know, since I managed the British Airways cabin service for four years in the eighties. In-flight sales have never been a significant part of airline profitability. 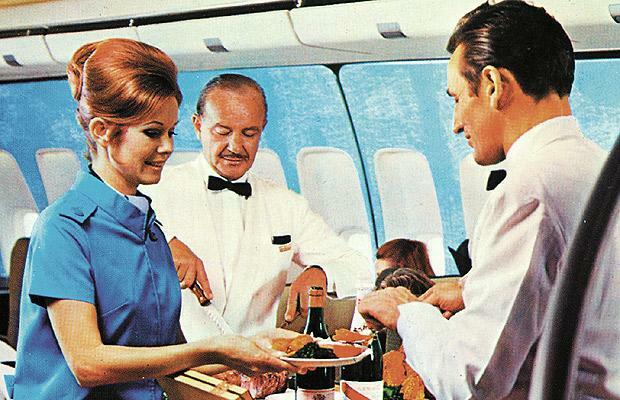 Before managing cabin service, I was British Airways Chief Economist, when I tried to remove on-board catering from the then new Glasgow Shuttle, and replace it with free breakfast in the departure lounge. In the end, I was defeated because the aircrew would not give up their hot breakfast and afternoon tea on board, and BA hated to give anything away for free, anyway. All our research at that time showed two things: One, our passengers really liked to have small, on-board catering and, two, they generally found so-called duty free purchases inconvenient and better done in the terminals. The most distasteful element in this story about Ryanair is that their scratch cards are actually promoted, and sold as contributing to charity, mainly for children. The airline claims only to take a small management fee. So, one has to ask, why the pressure on the crews if it is a benevolent activity? At the root of all this is the question of why there is so much emphasis on selling drinks and snacks. Even at the on-board prices, this revenue has to cover not only the wholesale cost of the items, (And Marks and Spencer’s entry into this market at British Airways says everything about how profitable it must be.) but the real cost is the actual handling. Those trollies all have to be prepared and handled on the ground to be loaded into the aircraft. Then there is the fuel costs and on-board space for the trollies themselves. As for duty-free, this is such a nonsense because for most flights in Europe there are no duties charged. The industry pretends that the on-board sales are a bargain. But they all must be purchased, stored and accounted for. And they all add to the cost of carrying them on the aircraft, not to mention ground handling again. And, moreover, the new trend is expensive, glossy catalogues, and internet sales. The airlines should stick to their knitting! Let us look at the numbers. A Ryanair aircraft produces about £24,000 of revenue per flight, after tax and charges. To be chasing about £700 of incidental revenue per flight looks really weird. The scratch cards go to charity, the snacks are cheaper and nicer from Pret a Manger, and the duty frees are mostly tired and cheaper at the airport. Why should Ryanair be forcing their crews to sell more, and persisting with a snack trolley which, because of payments, occupies almost the whole flight? This is strange when, even in their own manual, safety and care of passengers is their raison d’être. This is more than just odd. It is a scam, and not a very productive one. At least there was always British Airways who provided free food and proper cabin service for the higher fares they charge. But now they have gone down the same miserable path too, turning their flights into Marks and Spenser Simply Foods with extra tired toiletries added. The oddest thing about this whole trend is that it is not only making flying less enjoyable for the passenger and distracting the crews, it is not even profitable. One final point, the highly profitable Far Eastern airlines have in general nothing to do with this nonsense. The food is free and the merchandise is in the terminals.